So, I hate tomatoes with the passion of 1,000 hells. Really, really truly. 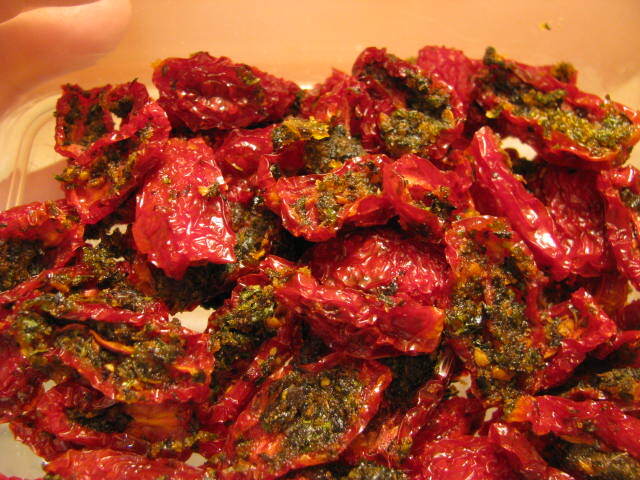 But sometimes a recipe calls for sun-dried tomatoes, and it can't really be made without them. If they have enough flavour, I'm OK to add them to the recipe, but it's kind of a crap shoot on if they're too tomato-y for me to handle. Especially when they're raw, which is how sun-dried tomatoes are. It occurred to me a couple of weeks ago, that I could easily make them with Arthur (my Excalibur dehydrator), and control the flavour. And it would be cheaper, as I'd get more, and more convenient, since every other time I need them, it seems they've falled into some sort of alternate dimension because they're nowhere to be found! Anyway, I bought a pack of organic grape tomatoes, and marinated them for 24 hours in cold-pressed olive oil, garlic, onion, and basil. I didn't add any sea salt because it wasn't like I was going to snack on them, and I'd rather add salt to the dish, if need be. I set them dehydrating at 105F for about 36 hours, checking on their progress periodically, poking at them like a hen watching her eggs. When they were sufficiently dry, then turned out like this! And didn't spew! They were actually tasty (for tomatoes)!! 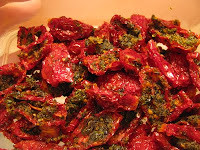 My sun-dried tomato babies turned out! I'm so proud!! Finally getting to see your site. Everything looks so great and yummy. So glad that you are spreading the word about raw food.